Summary: The SF4 Semi-Finals today were filled with some exciting matches and exceptional play. By far the two players who had the best performances though were Justin Wong and Diago Umehara. Both players consistently controlled their matches, and while they had a few close calls here and there, it was rare when you got the sense that either player was going to lose a round. For the most part, these two seemed to be playing in another league. Eduardo "Vvv scrub" Perez-frangie from Puerto Rico definitely deserves special mention. He played an outstanding Boxer through the day. Lots of great pressure and anti airs, coupled with great use of his Crouching/Standing Light Punch kept opponents off guard. He's someone to look out for in the next round of the competition if he can keep up the level of play we saw today. Here's how the Top 8 shook out along with their main character(s). GameSpy has a new preview of Marvel vs. Capcom 2 up, but the exciting news is that they show the games various graphical filters. Users can check out these videos in high resolution glory, seeing the game's 'Classic', 'Crisp' and 'Smooth' filters in action. It defaults to the 'Crisp' filter when you load up the title, but GameSpy staff thought the 'Smooth' option looked better. After you check out these videos, feel free to leave a comment explaining which graphic filter you thought looked best. Kara "KaraFace" Leung took some photos of the new Mad Catz Tournament Edition FightStick at Evo. From the shots, it looks like a new skin for the Tournament Stick that was teased earlier. Kara Leung also took a bunch of other very nice photos at Evo, so hit up the link above to see the rest. Thanks go out again to Jon for the heads up. DJay over on Capcom-Unity let readers know today that they will be offering exclusive designs for the Mad Catz FightPad and Tournament Edition FightStick at this year's Comic-Con, which starts July 23. There isn't much known about the sticks currently, but Jon, a reader, sent along this photo of the box. The range of Mad Catz Street Fighter IV FightSticks and FightPads has been wildly successful and many Asian territories have expressed great interest in stocking the range. Sadly, our Street Fighter IV license does not extend to Asia so for the Asian regions we are releasing the FightSticks and the FightPads without the Street Fighter IV graphics. The products will be identical in every way which counts. No features have been changed other than the removal of the Street Fighter art and the loss of the highly collectible Street Fighter IV box art. At this time the range is planned only for release in Asian territories and will NOT be available in any other region. They also grabbed this screen capture from Play-Asia.com before the listing was taken down. You can see from the Comic-Con box and new Tournament Edition joystick design that these products have the same color scheme, but there are likely slight differences, as the Comic-Con box clearly has the Street Fighter 4 logo on it. And finally, Udon will have a new Street Fighter artbook at the convention. SF20: The Art Of Street Fighter is a 320 page hardcover offering. It includes artwork from the original Street Fighter game up through Street Fighter IV and the vs. crossover games. In a move that's likely to anger some fans, Sony will be releasing Marvel vs. Capcom 2 on the PlayStation Network on August 13, a couple weeks after its release on XBox Live. The game will go for $15, just like on Microsoft's service. It's hard to believe that Capcom would purposely delay the release for the PlayStation 3, so one has to wonder why the release dates ended up being a couple weeks off. Some people have speculated that the rumored retail pack will be a PlayStation 3 exclusive to offset the difference, but so far that hasn't been confirmed one way or another. Also, others stated that since the MvC2 demo was a PlayStation exclusive, an earlier release was the reward for XBox owners. But at this point, it's all speculation. If Capcom or Sony clarifies why the release dates ended up being off, we will have it posted here. There's a special edition of Live on Three starting at 4 p.m. PST with some of EVO's competitors, including Justin Wong, Gootecks and Mike Ross among others. Live on Three is hosted by DJ Wheat, who did a great job with live coverage at this year's Devastation tournament, so this should end up being a good show. Also, the Evolution Fighting Game Tournament kicks off tomorrow, so keep hitting the EventHubs.com front page for live coverage of the competition. Early PC sales good, scoreboard hackers to be banned? There are more plans for the PC version of Street Fighter IV in the future to boost sales, according to Capcom's Christian Svensson, but even so the early outlook is a positive one according to a recent post he made on the Capcom Forums. He also chimed in on the leaderboard hackers and what you can and cannot do with the pirated version. Here are his comments. Can you play a pirated version of PC SFIV online or save your progress? Also, how have the sales been so far for the game? I won't comment on sales other than to say I'm cautiously encouraged by the early support and I have some interesting plans in the coming months that I think will make these numbers and the PC community even better. Sven: That is one possibility I'm considering. Unfortunately the re-release of Marvel vs. Capcom 2 will not have double blind select, Capcom's Rey Jimenez stated on the Unity Boards. JimmyRey: Actually, the double-blind select in HD Remix is not a feature of the netcode and something that was written into the UI code. In HD Remix, not only was the UI redrawn, but it was also highly tweaked, and this allowed us to put in the blind select. Unfortunately, redrawing and tweaking the UI was not within the scope of the MvC2 project. Believe me, if we could've done it, we would've. We did it in HD Remix and we think it's a great feature, but MvC2 was just made under different parameters that don't allow for that kind of tweaking. 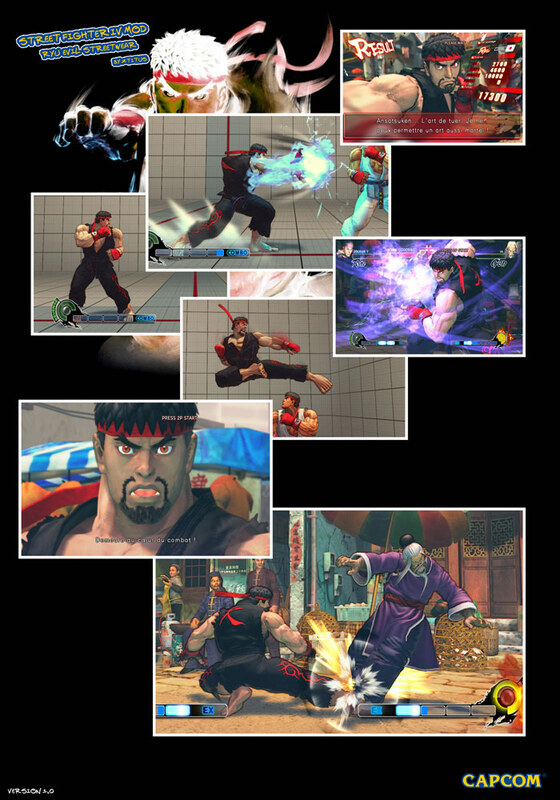 SeedyROM on SRK pointed out some PC skin modification screen shots for Street Fighter 4. Here's links to some of the better ones. You can also find a few videos here. SeedyROM also included instructions on how to change your skins around. 2) Find your SF4 Characters directory. Steam version: "C:\Program Files\Steam\SteamApps\common\street fighter iv\Battle\Chara"
3) Go into the folder of the character you want to change. Remember they are Japanese names so Boxer is "BSN" (Bison). 4) Whatever the .emz file you download is called, make a backup of the old one first. For example, Chun Li's file is "CNL_01_05.col.emz" so rename that "CNL_01_05.col.old" and copy the new modified one from the zip file in there. 5) Load the game and pick the proper character/color to see the skin (more in notes on this). Enjoy! -These changes do not appear to cause issues online. They are local only and the game doesn't appear to have checksums/checks in place. Still, CHANGE AT YOUR OWN RISK. -The filename explains which color you need to choose to see it. For example: "CNL_01_05.col.emz" means Color #5 so you must unlock that color first. -You don't appear to be able to change the color name. So you can't rename "CNL_01_05.col.emz" to "CNL_01_01.col.emz" and force it to use Color #1 because it will crash (has for me anyway). You can find links to the current downloadable files on this thread. With the Evolution Fighting Game Championships starting this Friday, we thought it would be cool to take a look back at last year's Evo. On Ponder's YouTube channel you can find pages and pages of videos of Marvel vs. Capcom 2, Super Street Fighter 2 Turbo, Street Fighter 3 Third Strike and other games from that competition. This tournament featured some amazing talent — just like this year's is scheduled to — and many of the matches are spectacular. Here are links to some of the ones that stood out. Hop this link to see many more clips. At this year's Evolution Fighting Game Championships Capcom will be awarding prizes for Marvel vs. Capcom 2 and Tatsunoko vs. Capcom challenges. These events are not part of the official tournaments, so anyone attending can participate and win some nifty prizes. Here's a note from Capcom-Unity on what people can expect. To celebrate this utterly ridiculous amount of hurt, the TvC competition will be Biggest Single Damage Combo. Entrants will have three minutes in practice mode to try to crank out the largest damage combo they can with any character of their choice vs. practice AI set to auto-block with Super meters set to infinite. In case of a tie, the finalists will have 30 seconds to record their follow-up combos. Scores will be posted on a white board and any EVO attendees will be welcome to try their hand. Capcom put out several more videos for both Tatsunoko vs. Capcom and Marvel vs. Capcom 2 today, and they also included screenshots of the latter game along with character artwork. Here's the images they sent along in the package. You can find a few more MvC2 artwork by Joe Vriens over on Capcom-Unity. Sensationalizing the story a little bit, VideoGamer.com stated, "Capcom on SFIV: Sagat and Seth ARE overpowered!" This headline was based on a quote from Street Fighter IV's arcade producer, Ryota Niitsuma. The actual quote from Niitsuma reads, "Yes, Seth and perhaps Sagat might have turned out a little bit stronger than we expected." But he later on added that both characters aren't, "too out of proportion." While this isn't stating anything most players don't already know, it is intriguing to see it coming from a Capcom staff member. Since Capcom is waiting for the big tournament results to come in to decide on balance changes, and with a 2nd version of the title likely in the works, I'm curious how potential balance changes will come about. Will Capcom patch the game before they release a 2nd version, or will they just include balance changes in the upgrade? Thanks to B.A.L. for the heads up. On July 17th, the 2009 Evolution Fighting Game Championships kicks off. The tournament runs through Sunday and we'll be providing coverage of the event through the weekend here on the front page. Also, this year you'll be able to watch a live stream of the festivities. Here's what you can expect. Special appearance by Street Fighter IV producer Yoshinori Ono. The world’s largest live Street Fighter IV competition. Tekken 6 playable on console. Watch all the action streaming live, for free, featuring top players and expert commentary. The best players from around the US and the world, including Japan’s legendary champion Daigo Umehara. The newest build of Tatsunoko vs. Capcom: Ultimate All-Stars. First publicly playable Marvel vs. Capcom 2 for X360 and PSN. Complete coverage from IGN Insider, recording HQ, direct-feed tournament matches available for download following the event. VideoGamer.com has posted the full text from their interview with Tatsunoko vs. Capcom's producer, Ryota Niitsuma. You've probably read a few excerpts from this interview, but even then there's some compelling stuff talked about in this article including that the mini-games will be reworked and the game itself will be rebalanced. If you're interested at all in the upcoming title, this is definitely worth looking at. Here's a grab. And Capcom uploaded some new artwork for the game featuring Doronjo, Morrigan, Saki and Yatterman No. 1. Seth Killian and Christian Svensson both made a number of posts on the Official Capcom Forums discussing several topics. They cover why Tatsunoko vs. Capcom was developed on the Wii, the custom model hacking that's happening on the PC version of Street Fighter IV, if anything will come of Sammy vs. Capcom, plus a few other things. Seth: I don't think it was a matter of cost [...], it was basically a decision from the Japanese arcade division worked out with Nintendo. Of course they were also thinking about the plan for a Wii release. 1) This was originally planned as a game exclusive to Japan, where the arcade scene is still a going business concern, and the X360 is comparatively less significant than the Wii. 2) This game was begun before anybody knew that the arcade/X360/PS3 Street Fighter IV was going to be a hit, and that fighting games in general would be back, and especially in the West. It's easy to take info we all have today and wonder about decisions made earlier, but it's not always a great way to understand why people made the decisions they did at the time. What does Capcom think of the Model Switching in SFIV (PC)? Also, are you really giving free download codes for the game via Twitter? Seth: Painful to watch, although also pretty darn funny. And yes, we give out a bunch of codes on Twitter. We've done everything from free mobile games to costume codes to XBL Age of Booty to Steam SFIV. It's semi-random, so you just have to keep your eyes peeled. There will be more coming, I can promise you that at least. Long ago you released info about collaborating with Sammy and making a Sammy vs. Capcom game, will anything come of it now? Will there be an option to use the Japanese announcer in the upcoming US release of Tatsunoko vs. Capcom? The old announcer used to say things like "Aerial Rave" and "TATSUNICAL!" Does piracy hurt Capcom badly? Sven: It hurts all publishers and developers badly. We do have a number of steps we take to dissuade it/curtail it that I won't detail, but you can't ever stop it. Will Marvel vs. Capcom 2 have rooms for multiple players and a spectator mode? Sven: Yep. Just like SSF2T HD Remix. Christian Svensson wrote up a very interesting post on the Unity Boards discussing what's involved in porting their titles over to other systems. He mostly talks about Street Fighter 4 on the PC, but also touches in on the upcoming release of Marvel vs. Capcom 2. Everything is relative... porting in general is as much art as science, depending upon what you're porting from and porting to. Using SFIV as an example, we've moved from code that had two systems with fixed/known components. On a 360/PS3, we know what GPUs they have. We know exactly how much RAM they have. We know exactly what OS limitations and capabilities are. They don't change from my house, to your house, to your cousin's house. Porting to a PC in an optimized fashion, has a slew of complexity. We have no idea what OS version your running (XP? Vista? Win 7? With service packs?). What GPU you have. What CPU you have. What motherboard you have. How much RAM you have... hell, we don't even know what driver versions you're likely to have running. So we need to optimize the game to run on countless permutations and setups which is a hell of a lot of work. And on top of that, we added features to take advantage of the fact that some people have PCs that are more powerful than 360s and PS3s. So we added parameters for new rendering shaders (ink, etc.) support for higher resolutions, higher forms of MSAA, AA, self-shadowing, higher quality shadows, etc. PC users like to tweak things and use a wide array of input devices, so we had to allow for key binding as well as supporting our "preferred controllers" such as SFIV sticks and pads out of the box. For PS3/360, we don't even have to think about those issues. That's just one example... all of that takes a lot of work and testing. You guys know when we shipped SFIV on the consoles. The PC version was concurrently in development during most of SFIV's cycle... it did take us an additional six months of dedicated PC development on top of that to turn out a finished product. Could we have done it faster/cheaper or cut more corners? Probably. But that's not going to please fans. Suffice to say, we're taking what was Naomi/Dreamcast code that has been output in a way that 360 and PS3 can interpret it and making a whole lot of changes to it on the fly. We have to add a new front end to account for all of the TRCs/TCRs that Microsoft and Sony have with regard to interface standardization and features like trophies/achievements. We have to include new settings and options and online menu support. We had to plug in matching and lobby systems that never existed and that work with PSN and XBL. We had to optimize net code for a game that was never meant to support it (and that is VERY fast paced which makes it that much more difficult). At the same time, we're doing real-time sprite filtering of everything on screen. Rendering all of the 3D assets in resolutions far higher than they were intended and implementing widescreen support (again, something the original code was never meant to do). We had to fix a few bugs that existed in the original version of the game too. Suffice to say, the only thing easy about porting is that you know what should be coming out the other side when you're done. In that regard, there's fewer unknowns than with new development. The challenge is, the fans ALSO know what's supposed to be coming out the other side... and if we don't get it right, we certainly hear about it. With new development, those sorts of comparisons don't exist. You can fail in entirely different ways with new development, but with ports, there's no hiding anything. I could talk about Okami too... which had a whole slew of technical challenges... but I'll save that for another day. Seth Killian also fielded another question on if it's more difficult to port Dreamcast games compared to PlayStation 1 titles. Yes, unfortunately Dreamcast ports are much, much harder and more expensive than straight PlayStation ports. People hoping to see PS ports are likely to see some of their wishes come true, while Dreamcast stuff is more on the order of MVC2, which was very challenging, considering it is in some respects "just a port." DC rereleases take a lot more time, effort, and money that we need to believe can be recouped in sales. Doesn't mean they can't happen, just means there will be less of them in the foreseeable future.